SkyLIGHT PVX 5.0 is the newest version of Accedian’s network and application performance management (NPM/APM) solution for enterprise. 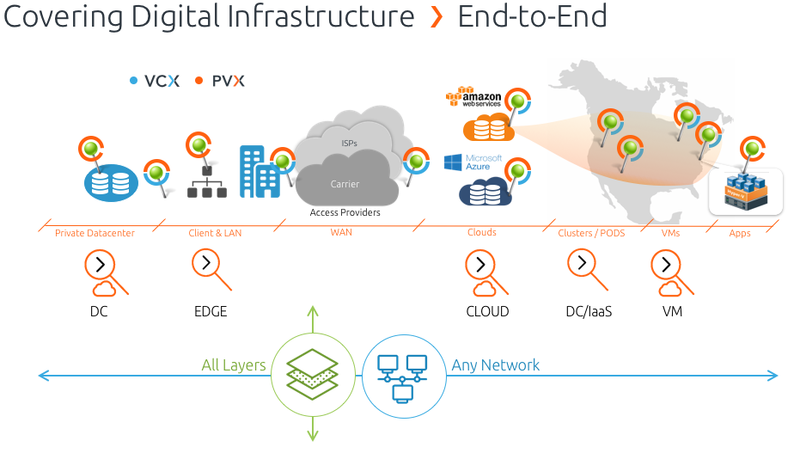 It features a major incrementation of the version number, from 4.3 to 5.0 (instead of to 4.4) because we feel that we have significantly enhanced—expanded if you will—the architecture of PVX to align it with Accedian’s vision of integrating real-time analytics into its full network and application management portfolio. This release will enable SkyLIGHT PVX to better address the dynamics of today’s IT infrastructure setups, which have gone from one where there were a known (or predictable) number of users, using a known array of applications from a known number of points of presence, to one where the network and application resources are being provisioned and retired dynamically—across physical and virtualized network and server environments, public/private/hybrid clouds and SaaS instances, and Infrastructure-as-a-Service and Platform-as-a-Service deployments—throughout the day as demand changes, meeting the needs of thousands of internal and external users. This emerging level of complexity makes it very difficult for IT operations to detect and resolve issues without the augmented insight that analytics can provide. The renewed SkyLIGHT PVX vision relies on 2 major components. The first is a real-time analytics engine and the second is an enhanced, analytics-integrated data store, at a scale that is much higher than what we have typically referred to as a data store in the past (i.e., as opposed to a capture appliance or device). SkyLIGHT PVX’s real-time analytics engine captures end-user experience, network performance, and application performance—up to the individual applications and database transactions—on-the-fly, in real-time from a wide-angle perspective. It reports on everything it sees happening on the network: all devices and all applications, for all users, across all transactions—without any configuration. It’s lightweight enough that it can be distributed across physical networks—from branch offices to data centers—as well as deployed on virtual networks. The second component, the data store, is able to aggregate data from each of the capture devices deployed across both physical (i.e., WAN, LAN) and virtual networks (i.e., software-defined networks or SDNs). It then provides intuitive reporting, real-time actionable insights, and the ability to navigate from very high-level data to low-level data with a handful of clicks. Both of these elements support the SkyLIGHT PVX value proposition, which is unified performance monitoring across the whole network and application chain. Starting with version 5.0 and as we continue to build on that foundation, we want to change the direction of the data flow from one where you pull data, to one where we push relevant insight to you—in real-time. We want SkyLIGHT PVX to provide you with guidance in terms of making diagnostics, looking for optimizations, understanding how the behavior of your system is changing, providing you with really effective insights, and pointing you to items that truly require your attention. SkyLIGHT PVX 5.0 features a responsive new user interface powered by dynamic dashboards, customizable widgets, an enhanced backend, and faster rendering. This new interface provides each user with more flexibility in the types of data that are presented. Whereas version 4.x of PVX featured multiple views into application and network performance, it only offered the dashboards that the PVX team had created. 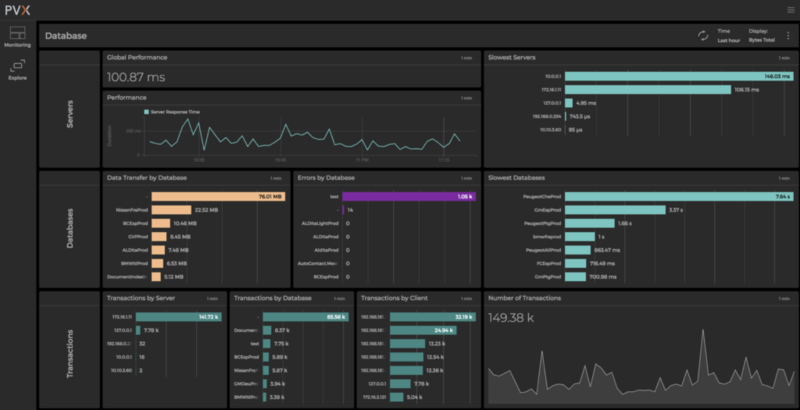 This new version of PVX puts the power of creating dashboards into the hands of users. You can modify existing dashboards (by cloning them) to meet your specific needs or you can create new ones from scratch that reflect the unique mix of applications, devices, and systems in your IT infrastructure. In fact, you can create application-specific dashboards based on the unique mix of applications running on your network. While each SkyLIGHT PVX user can have their own dashboard(s) that are particular to their needs, it’s possible to create dashboards that are common to all users. Dashboard widgets feature dynamic previews so that you can see what a given widget will display while you are creating it. You can also move dashboard widgets around the window, resizing them to offer some more prominence than others. You can also modify the source metric for a dashboard widget, changing it to one of the hundreds of performance metrics that are included with SkyLIGHT PVX. You can search from among existing metrics by typing in keywords–for example, “HTTP”, “Errors”, “Throughput”, etc.–and then select from the list that is provided. You can also combine performance metrics together in SkyLIGHT PVX 5.0 to generate new insight. For example, you can mix Layer 3 (TCP) information with Layer 7 (application) information in a single dashboard. Chart types can also be modified or the data can be presented as tables. You can annotate dashboard widgets with descriptions to provide context for other users; these are visible when hovering the mouse over the information button beside each dashboard widget. We have developed a new, more complete and robust version of our API, which will allow you to connect SkyLIGHT PVX programmatically to any other tool of your choosing: a log analysis solution, a business intelligence (BI) solution, a simulation platform, an intrusion detection system (IDS), or another reporting service. This enables SkyLIGHT PVX to become a data source for your other toolsets, leveraging the advanced, real-time analytics that PVX provides. In fact, you can access all of SkyLIGHT PVX’s powerful capabilities via the API. The RESTful API is based on JSON over an HTTP connection, which provides maximum interoperability. The PVX API is fully documented, providing access to a variety of filters and operators. The Performance Vision Query Language (PVQL) provides an intuitive, natural language-based approach, similar to SQL, for querying SkyLIGHT PVX 5.0 to access any performance data captured by PVX or any performance metric calculated by PVX that you want. You enter queries in a shell provided within the SkyLIGHT PVX environment and receive responses near instantaneously. With PVQL, you can query PVX and see what kinds of results are returned before coding using the integrated shell. Every one of the 300-400 metrics computed by SkyLIGHT PVX is accessible via PVQL. Once you have defined a PVQL query, you can use it to access data via the API or to create dashboard widgets. Support for real-time data processing and alerting is built into the engine underlying SkyLIGHT PVX 5.0. However, the capabilities are not being exposed at this moment; that will happen over the next 6 months. Between now and then, we are looking to work with a handful of customers, leveraging their production data to feed our machine learning model. We are conscious of how overwhelming alerts from monitoring tools can be and we want to come up with a better way, leveraging artificial intelligence to determine what really needs to be alerted in real-time and what can be brought to users’ attention with other methods and in other contexts. If you are interested in participating in the refinement of SkyLIGHT PVX’s real-time alerting capabilities, please advise your PVX account manager or a member of the PVX technical support team. With this release of SkyLIGHT PVX, we are expanding the options for remote capture. 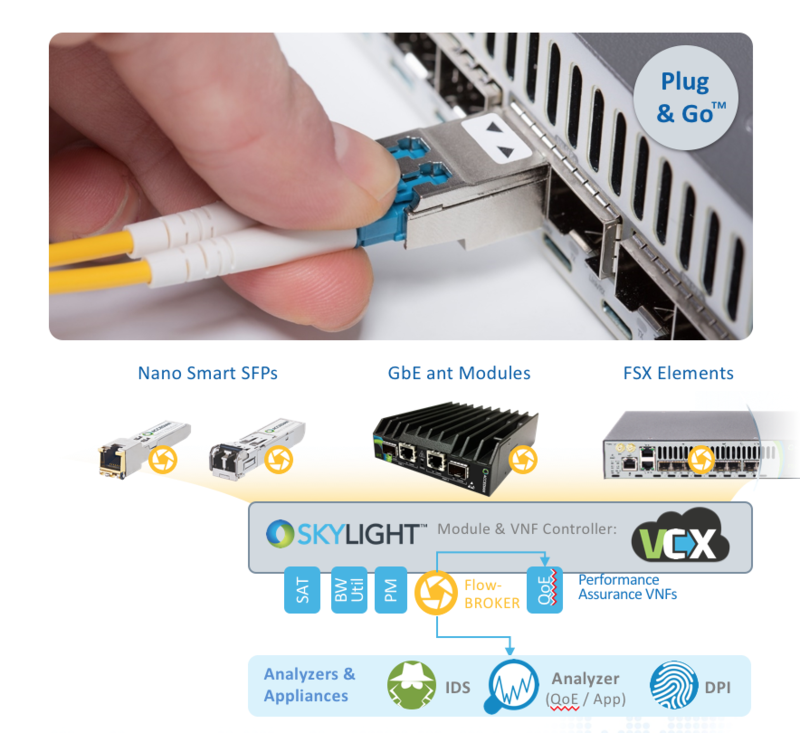 SkyLIGHT PVX 5.0 now includes support for Accedian’s FlowBROKER FBX virtualized packet broker. This lightweight appliance is ideal for deployment to remote sites (e.g., a small branch office) where it might not be feasible to position a physical or virtual PVX capture appliance. With FlowBROKER FBX installed, you have complete visibility from the edge of the network to the heart of IT operations, the data center. With no end-user configuration required, deploying FBX can be as simple as mailing the device to a remote site where even non-technical personnel can install the module, which then automatically configures itself. FBX captures 100% of TCP flows, timestamps packets, and forwards the metadata on for processing by SkyLIGHT PVX. Looking beyond version 5.0, we see the following capabilities being added to SkyLIGHT PVX or significantly enhanced. Support for capturing and analyzing traffic from, between, and inside public clouds, which also extends current visibility into private cloud to hybrid cloud applications. Support for microservices, including dynamic distribution and scaling, and understanding of their impact on service delivery, including insight into container-hosted application components. Providing the right data to the right person, with a minimum of browsing. The data you need, available from one place. We will build on the real-time data processing and alerting capabilities introduced in version 5.0 and refined during collaboration with key partner customers. Scoring of device and resource performance to provide additional insight and simplify interpretation. The ability to link directly from an email alert to the relevant data. This will eventually develop into an automated root-cause analysis capability. SkyLIGHT PVX 5.0 will be generally available by the end of May 2018. This release is included with your SkyLIGHT PVX maintenance license. Delivered as a simple download, SkyLIGHT PVX 5.0 will replace existing application instances. There are no changes to the underlying data structures or data stores as a result of this release. Full release notes for SkyLIGHT PVX 5.0 are available on the customer support portal. Enterprise Cloud Migration? Visualize it Easy!